Qualification information obtained from the Certification Guide to the CCM Examination. Please refer to this guide for more information. 12 months of full-time case management experience, supervised by a board certified (CCM) case manager who has been certified for at least 12 months. 24 months of full-time case management experience. 12 months of full-time employment as a supervisor of individuals who provide case management services. There are several very specific questions you will need to answer related to your eligibility under the moral character qualification. Please refer to the Certification Guide to the CCM Examination, section 6 for a list of questions to expect on the application. The CCM exam is an 180 question multiple choice exam in which you have 3 hours to complete. The CCM is recognized for reimbursement under the Post-911 GI Bill. You can download the application here. The CCMC is celebrating its 25th anniversary in 2017 and is offering a $25.00 discount to those who apply to take the exam before May 31, 2017. The next round of exams will be administered August 1 – 31, 2017. The deadline to apply for this round of testing is May 31, 2017. Another round of exams will be administered in December 2017. The application window opens July 1, 2017, and closes on September 30, 2017. The December exams are administered from December 1 – 31, 2017. The CCM Exam is an exciting opportunity to take your career to the next level. You’ll want to be prepared. There are many ways to study for this exam. One way is to use the CCM Certification Made Easy Guide This comprehensive, concise study guide is based on the blueprint of the CCM exam. This book was written specifically to help you pass the CCM exam. 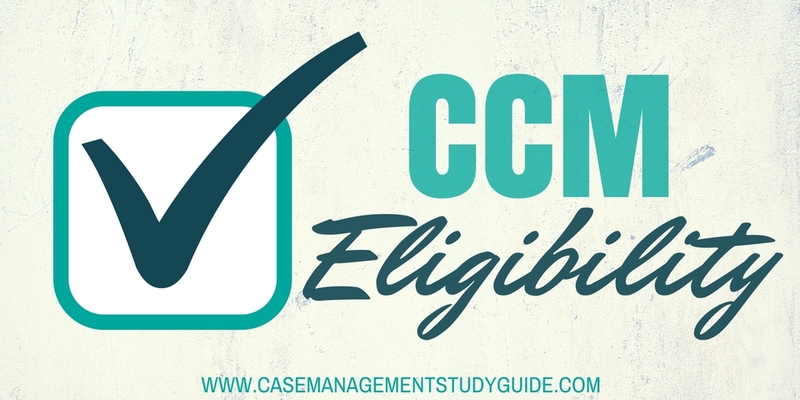 I hope this helps answer some questions you may have about eligibility to take the CCM exam. Don’t forget to open the blue tab and request your free resource to help you become a Certified Case Manager! I use to work as a Qualified Mental Retardation Professional for 3 years where I handled a case load of 35+. Would this be qualified as Employment Experience ? I am a case manager acute setting for 1 year working part time. Is my eligibility based on time meaning the year? Does the part time status change it? I am an Occupational Therapist who has been working at a Case Manager for a little over a year. If I apply for my certification, can I get credit hours towards continuing education for OT? Hi Amanda, Thank you for the great question. You are probably already aware of the answer but this is a question for your State Board of Occupational Therapists. Can you take the CCM with a bachelors degree in psychology and masters in social work? Hi Nahir, yes we have several courses available. One is an Online review course good for one year and is completely online. The second one is ‘live’ via a webinar platform and is given 3 times a year the months before the Exam is given. For more information on both please go to https://casemanagementstudyguide.com/case-management-certification-review-course/ and https://casemanagementstudyguide.com/online-live-ccm-prep-course/ Thank you so much. I am a RN, BSN and work as a Utilization Review Care Manager for a large hospital. Would I be eligible for taking the CCM exam? I’m an occupational therapist. I’ve worked in the home setting for 7 years. Professional growth is important, however in home health, there’s not much room to grow. This sounds wonderful. How many times we can take the test if I failed the first time? I know you can retake several times but for the exact numbers and details, please call the CCMC at the number at the end of the article, they are extremely helpful. Hi Theresa, It’s very hard to decide career advancement for someone else but the CCM Certification in our opinion is the Gold Standard. Here is a resource that may help in your decision-making process. Stepping Up to Certification, The Case Manager’s Guide to Certification: Achieving certification is part of one’s professional development. Doing so allows you to demonstrate your expertise and experience in your chosen field of practice. Case managers have several national certifications they can achieve, but which one is the right one? Only you can make that decision. Stepping Up To Certification, The Case Managers Guide to Certification is an objective and comprehensive report that provides an overview of the available national certifications specifically in the area of case management. If you are thinking about stepping up to certification this is a must read report! Click here to download. I am an rn with over 30 years exp. I have done case nut in the past. For about 4.5 years. How do I get credit for this. I was supervised only be 2 mds. Good day,i am a Chief Medic in charge of of over 100 staffs providing health care service in the following area. I am base in Nigeria and i really want to be certified ,if i could do the course via online,that will be great and well appreciated. I have been in case management, home care and hospital based, for 20 yr. I have been teaching for the past 7 years and only work around 600 hours a year in a hospital setting as a case manager. How does one meet the work hours requirement if not working full time? I’m an RN (20 years) and a NP (12 years). Most of my recent jobs have been doing in-home visits to assess, diagnose and treat patients. I’ve also case managed home health and hospice patients. But I took time off to care for my elderly mother and haven’t worked since 2014. I’m applying for jobs and would love to get certified as a case manager. I am not able to show CM employment experience within the past 5 years, but certainly think I have sufficient experience and background to be able to get certified. Would I be able to get an exemption? I have been medical case manager for 4-5 years, but i never take any class or any course for case manager. I am as LVN. Can I take exam or not? Where do I check if my degree will count towards a recognized college education? I have 3 years experience in complex medical case management, was previously certified (CCM). I am not employed at this time. Can I take the exam? You have not stated whether you let your license expire or not. In either case, I would recommend going straight to the source where they can help you. https://ccmcertification.org/get-certified/certification/ccmr-eligibility-glance You can also call them directly at the number on the bottom of their site. I am a COTA, can I become certified? If you have case managed home health patients for 13 years. Can you take this exam?